If you’re ready for a garage make-over, if you value you garage as much as the rest of your home or if you own a luxury or classic car and want a garage worthy of your prized possession, let MARTENS install an industrial rated epoxy floor that will turn an otherwise dull looking garage into your own personal showroom. With more than 25 years of commercial epoxy floor coating experience, MARTENS now offers its extensive expertise to homeowners. With MARTENS on the job, you can be sure your epoxy floor will come out perfect. Your garage will look so good, you'll want to move in. Old garage floor, pitted, cracked and stained from salt, oil and years of heavy traffic. 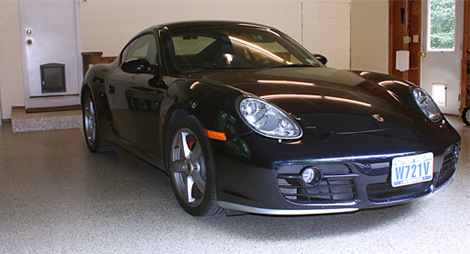 No matter how well you clean it, your garage floor will still look dark, worn and unsightly. 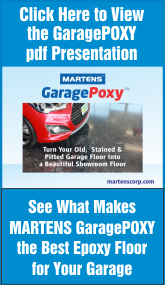 GaragePoxy treatment by MARTENS, not only protects your garage floor from salt and chemicals with a super tough and durable epoxy coating, it brightens up your garage and gives it that showroom quality look. Single car garage finished in tan. Make it a living space during the summer. Luxury two car garage with an ultimate 1/4" thick epoxy finish. Two car garage finished in gray with blue flakes. MARTENS will turn your old, pitted and stained garage floor into a beautiful smooth surface that will be easy to maintain and whose durability and new look will last for a very long time. Epoxy is the perfect coating for your garage. An engineered composite, it is much tougher and more durable than enamel paints and will last much longer than any conventional garage floor paint. Epoxy is impervious to chemicals, oils, solvents and acids. Any type of spill can be easily cleaned up. 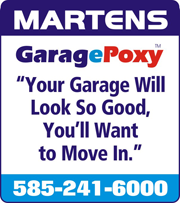 How does MARTENS GaragePoxy compare to do-it-yourself water based epoxies sold in big box discount stores? There is no comparison. MARTENS GaragePoxy treatment is an industrial grade epoxy commonly used in commercial applications, it will provide a thick and durable, non-skid coating that will outperform thin coat or water based epoxies. Ideal for Basement Floors, Concrete Patios, Kennels, Woodworking Shops, Barns and Animal Shelters. One of our customers was so impressed with our epoxy work on his kennel floor, he had us do his garage as well. Looks very neat and is easy to clean. 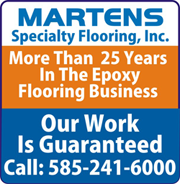 MARTENS has been installing Epoxy floors in commercial and industrial buildings for more than 25 years. Over the years, we have encountered and overcome any situation you can think of. So when you hire MARTENS to install your garage epoxy floor, you can rest assured of a problem-free, top quality installation that will last for many years. For your peace of mind MARTENS is fully bonded and insured, you won't have to worry about anything should some problem arise. Unlike a new start up company, that may be here today and gone tomorrow, MARTENS is one of the most established epoxy flooring installers in the area. We have been around for many years and will be here for many more years to come. Epoxy floors is our business. MARTENS coated this patio entrance with a heavy duty waterproof epoxy. It looks beautiful and makes an inviting entrance to the home. MARTENS can apply epoxy coatings to other areas of your home including basements, outdoor patios and animal shelters. Advances in composite technology has fostered new waterproof materials. 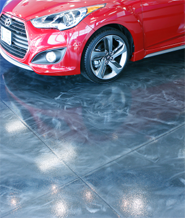 Bare cement floors are porous and dark, not only absorbing light, they allow moisture vapors to come through. Epoxy floors reflect light, and are waterproof, providing added protection against moisture vapors. Imagine how much brighter, neater and drier your basement or woodworking shop can be with a MARTENS epoxy floor. Have your favorite team, college or corporate logo embedded in your garage or shop floor. The example shown on the left is a color rendering of a football with a team logo. It is 9 feet wide and five feet high. MARTENS can embed any logo design, art or photographic image in an epoxy floor. The possibilities are endless. Color rendering of football with team logo is embedded in epoxy coated floor. Image is protected with a super tough clear epoxy coat. Color chips complement logo colors. There are many colors schemes to choose from...view colors. 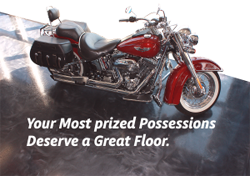 With a Beautiful, Show Room Quality Floor. MARTENS show room quality floor at a base price. We recommend this option only if you are positive there are no moisture vapor problems in your garage floor. Assures the durability of your installation with a moisture barrier. 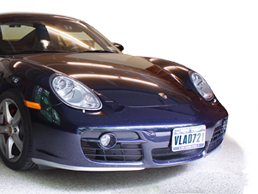 We highly recommend this option if you are unsure about the moisture and vapor content below your garage floor. A moisture barrier for durability, plus an epoxy aggregate layer that provides scuff and abrasion resistance and improved traction. The additional coating also enhances durability. In addition to a moisture barrier and an epoxy aggregate layer that provides scuff and abrasion resistance, decorative flakes can be added to provide a colorful texture that can be matched to any desired decor. Luminescent flakes are also available. If you are considering a basement makeover or want a more tough beautiful basement floor for your wood shop, MARTENS can transform you dark, dull basement floor into a bright, beautiful and easy to maintain floor. A basement epoxy floor, not only adds beauty to your basement, it provides the added benefit of a durable seal against moisture vapors which are usually diffused by bare concrete floors. Call us for more details. Salt and Abrasion Resistant Coating.